Tomasz Plodowski has been showing his unique sterling silver jewelry designs and receiving top honors in major art exhibitions all over Europe since 1986. Tomasz’s distinct style has an architectural flair that is undoubtedly a result of his engineering background. Sleek edges and subtle curves convey a determined sense of contemporary sophistication. Tomasz’s art is sure to impress. 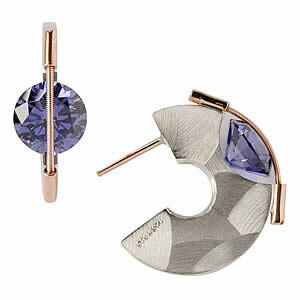 All jewelry featured on our site are authentic Tomasz Plodowski jewelry and stamped with his name. 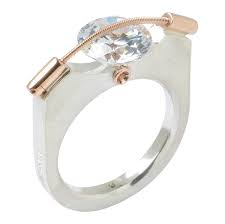 Can I have my own diamond/stone set in one of Tomasz Plodowski’s rings? I am unsure of my size. Can I exchange the ring for a different size if it does not fit? Yes, for sizes 5 – 8.5, we are happy to exchange for another size. (Sizes 4, 4.5 and 9+ are not available for an exchange.) However, we strongly recommend having a local jeweler size your finger, as this eliminate any guess work. 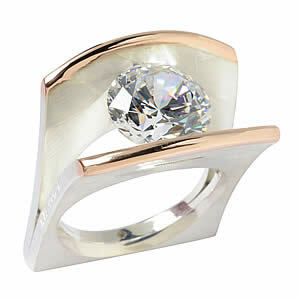 Tomasz Plodowski rings run true to size, so any jeweler will be able to tell you which size best fits you. Will the stone get loose/fall out/ break? How do I clean my Tomasz Plodowski piece? For styles that have easy to access surfaces, we recommend using baking soda and peroxide toothpaste. Simply dab a bit on a Q tip or finger and rub onto the surface, rinse well and dry thoroughly. For the more elaborate designed rings, a popular sterling silver cleaner like Connisseurs or Tarnex will work beautifully. Can I get a different colored stone than what is pictured online or offered in store? Yes! There are other options available. Please contact us.